After repeated calls for him to do so, Mark Zuckerberg has decided he will testify before Congress. 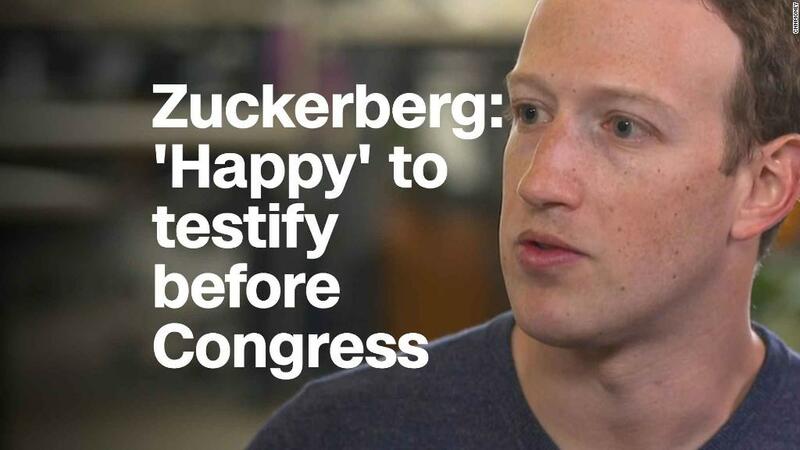 Facebook sources tell CNNMoney the 33-year-old CEO has come to terms with the fact that he will have to testify before Congress within a matter of weeks, and Facebook is currently planning the strategy for his testimony. The pressure from lawmakers, the media and the public has become too intense to justify anything less. The Facebook sources believe Zuckerberg's willingness to testify will also put pressure on Google CEO Sundar Pichai and Twitter CEO Jack Dorsey to do the same. Senate Judiciary Chairman Chuck Grassley has officially invited all three CEOs to a hearing on data privacy on April 10. That means Washington, not London, will be the stage for the trial of big tech. Zuckerberg today turned down a request from British lawmakers to answer questions on the social network's privacy practices and will send two deputies instead. The forthcoming Capitol Hill drama is the culmination of the tech backlash that went mainstream last year. The perfect storm of political intrigue and media hype surrounding the hearings has the potential to radically change the way Americans view big tech. Facebook has been enduring a crisis of trust ever since it was revealed that Cambridge Analytica, a data firm with ties to President Donald Trump's 2016 election campaign, reportedly accessed information from about 50 million Facebook users without their knowledge. Facebook now faces a Herculean effort to restore public trust in its commitment to privacy and data protection, sources at the company have told CNN. The scandal also highlights a problem that is built into the company's DNA: Its business is data exploitation. Facebook makes money by, among other things, harvesting user data and sharing it with app developers and advertisers. Preventing those buyers from passing that data to third parties with ulterior motives may ultimately be impossible.